A spiffy new web home for RidgeGate. 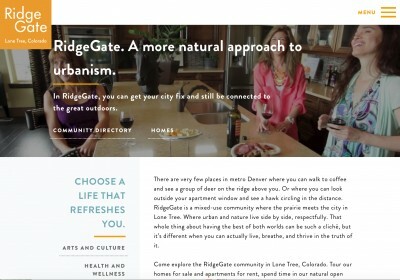 We hope you’ll tour the updated website for RidgeGate – a sustainable community located in Lone Tree, Colorado. The new site offers a more visually dynamic experience, with a complete tour of homes, arts and culture, health and wellness, everyday life, as well as the business and commercial environment. Launch has helped RidgeGate evolve over the past decade, from a prairie of tall grasses and a few sprinkled homes, to a thriving mixed-use community that is one of the most vibrant places to live and work in Douglas County. View more of our work for RidgeGate.